Slip slop slap - it really is not as easy as that! The more sunscreen facts you know, the better informed you'll be when choosing sun care products for you and your family. Using sunscreen has become one of the easiest forms of sun protection we all rely on today in order to keep our skin safe from sun damage. There is quite a lot of information about what is good and what isn't but the following aspects will hopefully highlight areas requiring your attention when choosing your sunscreen, as well as how best to use them for ultimate protection. Sunscreens absorbs, reflects or scatters UV light rays. The UV light rays are divided into three wavelength bands - ultraviolet A (UVA), ultraviolet B (UVB) and ultraviolet C (UVC). Only UVA and UVB rays reach the earth. Form an opaque film on your skin that reflects or scatters UV light before it can penetrate the skin. They contain ingredients such as zinc oxide and/or titanium dioxide, which protect against both UVA and UVB rays. Original formulations of physical sunscreens remained white when applied to the skin. Newer formulations have reduced the size of the molecules and enable them to blend more with your skin tone and so are less obvious. Are absorbed into the skin, from where it converts it to a small amount of heat. 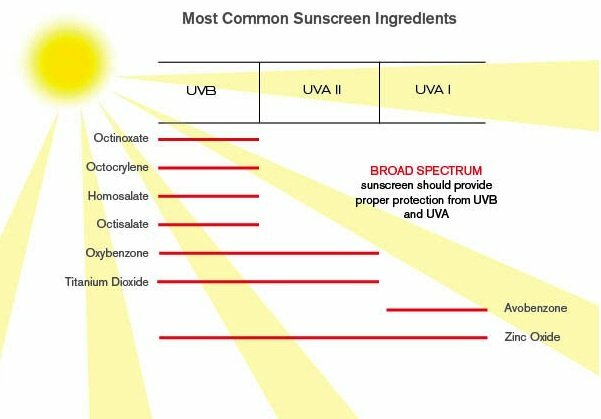 There is only one chemical ingredient that absorbs the UVA rays - avobenzone. Others, such as oxybenzone and octinoxate, absorb the UVB rays only. For broad UV protection, chemical sunscreens will need to contain more than one ingredient in order to be able to protect against both UVA and UVB rays. Easily the one sunscreen fact that most people judge a sunscreen's value by is the SPF, which stands for "sun protection factor". This appears on all sunscreen packaging as a number, declaring the amount of protection the sunscreen has been tested and certified for. This rating ranges from as little as 4 to as much as 100. It measures the fraction of sunburn-producing UVB rays that reach the skin. For example, "SPF 15" means that ​1⁄15 of the burning radiation reaches the skin through the recommended thickness of sunscreen. It does not indicate the degree of protection from non-burning UVA radiation. Most common SPF ratings in sunscreens range from SPF 15 to SPF 30. If you don't tend to burn easily when out in the sun, or are already reasonably well tanned, you can choose a sunscreen product with SPF 15. Those with fair skin or who have the tendency to burn easily, should rather opt for a sunscreen with at least an SPF of 30. 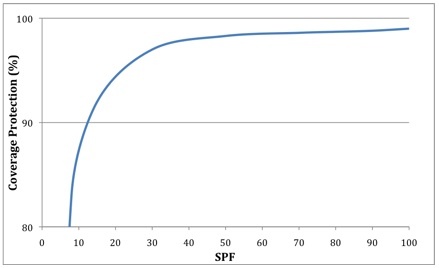 From the table below, you can see that the SPF protection curve rises sharply and then trails off. which are commonly asked questions. If you apply SPF 15 over an SPF 30, you will only have a maximum protection of SPF 30. Not, as some people believe, a combined SPF of 45. What 'broad spectrum' actually means, or implies, varies in many people's minds. What it actually should mean is that you get protection from all of the long-wave UVA and the medium-wave UVB rays. Protection from the short-wave UVC rays is not included as they are prevented from reaching the earth's surface by the hemisphere. To get good protection from UVA rays as well as UVB, look for sunscreens that list titanium dioxide, and/or zinc oxide as one of their ingredients. 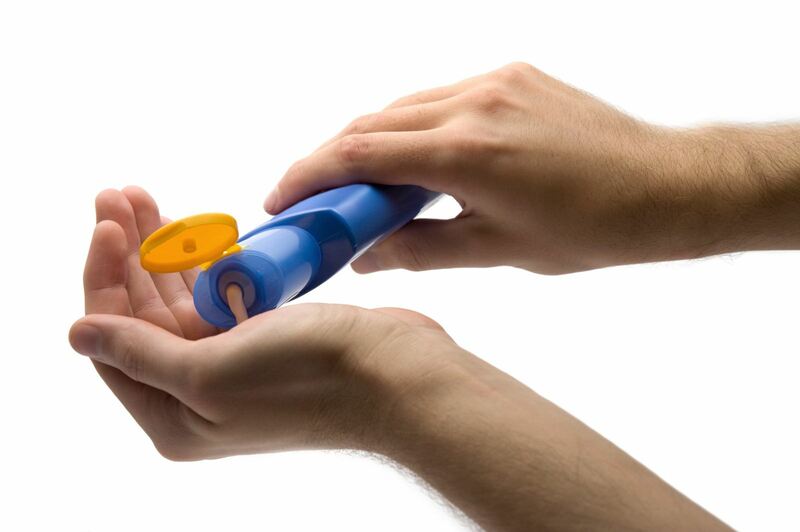 Sunscreen details printed on any tube of sunscreen should include the relevant information about when it will expire. This will relate directly to the ingredients contained within the cream, lotion, gel or spray. Whether a chemical or physical based sunscreen or a combination of both, there will be a limit as to how long they will be effective. From an expiry point of view, it will be greatly improved the better you look after your sunscreen. Eg. taking it to the beach and leaving it out in the full sun for hours on end will most likely create some sort of impact to the consistency. Whereas if you make a point of keeping it relatively cool and not exposed, you are likely to retain the quality longer. As a general rule with all sunscreens, apply 20 minutes before going out into the sun and reapply every 2 hours. Often a sunscreen will contain both chemical and physical, so hence the general rule is to apply 20 minutes before exposure. Physical sunscreens only last until you wipe it off or sweat it off. Chemical sunscreens in general become less effective once exposed to the sun. So reapplication often is vital for optimal protection. If you plan to get wet or sweat excessively, you can choose a sunscreen that is more water resistant than most, but bear in mind the fact they are not likely to be completely waterproof. These are common areas that are often forgotten and very often the areas that get sun burnt, as well as the common areas for skin cancers. Sunburns in these areas can also be particularly uncomfortable.